Duration: Inserting and synchronizing the song text line by line takes approximately 5 minutes for a 3 minutes song. 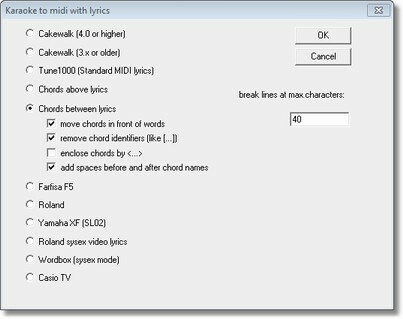 Method: The inserting and synchronizing song text line by line works for MIDI and MP3 files identically. use menu File/open to load a standard MIDI file or MP3 music file. GNMIDI will display information about the song in a new window. If the MIDI song already contains synchronized syllables a warning will appear. It can be ignored if you prefer synchronized lines. use menu Modify/Synchronization editor. 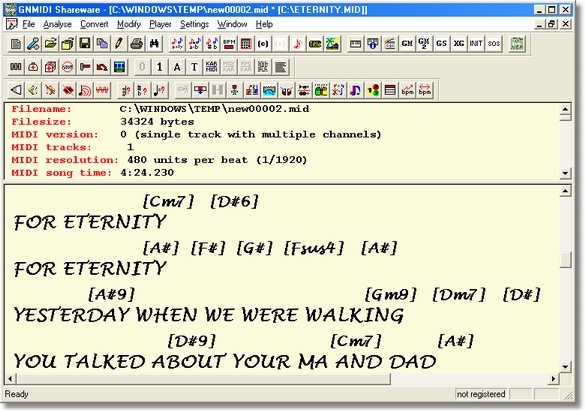 First a dialog will appear that asks for lyrics text. Existing lyrics will be offered in the lyrics dialog. Each line will later get its synchronization time so lines should not be broken somewhere in middle. The dialog offers 3 recording modes which are useful for different situations. All: all lines will be synchronized. Existing synchronization times will be forgotten. This mode is usually used for a new song and for rare case where you want to synchronize a song again from beginning. Part: only selected lines will be set to recording and all others remain readonly. Use the mouse to select a range of lines and then click on Part radio button. Extended mouse selection using left mouse button and Ctrl/Shift keys can be used. Test: this mode is used to test your synchronized times. The playing will start at first visible line till end of song or stopping the player. To get more precise you could play the song with slower speed instead of normal speed. Start the player (F3 key) and then concentrate to the song melody. Press F5 key (or press the synchronize next line button with left mouse button) at the right moment to copy the playing time to the line. If you were much too early then maybe it is still time to use key F6 to undo the recent synchronization click. Use stop button to stop the synchronizing and maybe do some corrections or leave the dialog. Set recording mode to Test and start the player using F3 key. See the coloring of the text if the synchronization times are precise enough. Use the mouse to select one or more lines that you want to synchronize again and then press the "Part" radio button. The lines get the attribute REC. Use start (F3) again to synchronize only these lines again. The song text will be displayed if it is already embedded and synchronized.